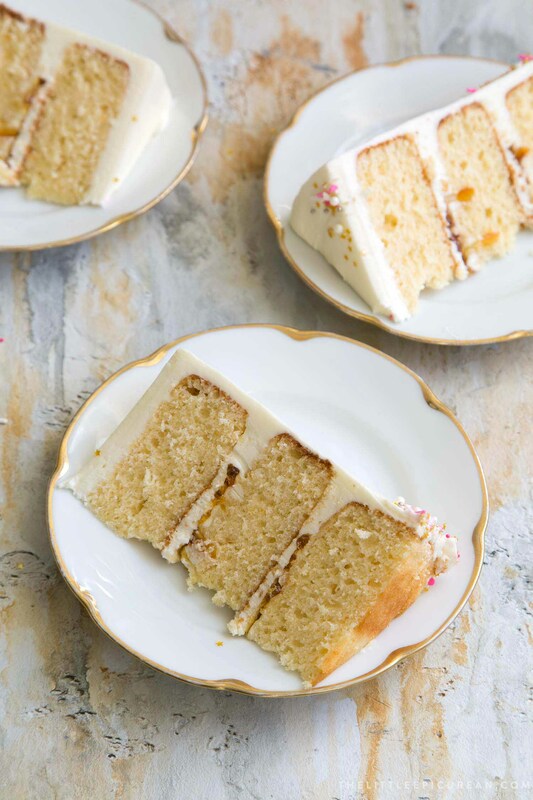 This ginger grapefruit layer cake is filled with orange marmalade and frosted with Swiss buttercream. Search for grapefruit cakes online and you’ll find a ton of quick breads and tea cakes. It took some serious digging to find a decent grapefruit layer cake. And then I stumbled upon this gem from King Arthur Flour. I made the cake recipe as is and then tweaked it to my preferences the second time around. The resulting ginger grapefruit layer cake is bright and tasty. It’s a cake that’ll bring you much needed sunshine on those cold winter days. In order to extract all that bright grapefruit flavor, both the zest and freshly squeezed juice is added into the cake batter. The oils within the zest bring a ton of flavor. However, be careful not to zest too much of the skin or you will reach the pith (the spongey white tissue). That part is rather bitter and unpleasant. Ginger and grapefruit made a wonderful flavor pairing. The zing of the freshly grated ginger helps to highlight the floral sweet notes of the grapefruit. This recipe makes three 6-inch grapefruit cake layers. The batter can also be baked into two 8-inch or 9-inch pans, as well. Once the cake layers are cooled, they are lightly soaked with a sweet ginger syrup. A thin layer of Swiss buttercream is spread on top. Follow by a layer of orange marmalade. The orange marmalade adds a slightly bitter contrast to balance out the sweet cake and sweet buttercream. If you happen to have grapefruit marmalade, substitute that instead for the ultimate grapefruit cake! Instead of using these cardboard cake rounds, I build the cake on top of an inverted cake pan. It allow for easy transport in and out of the fridge. Alternatively, use a round plate or serving dish. I use this cast iron revolving cake stand. I’ve had the same one for almost 10 years and it’s still going strong. If you are serious about cake making, I highly recommend getting one. 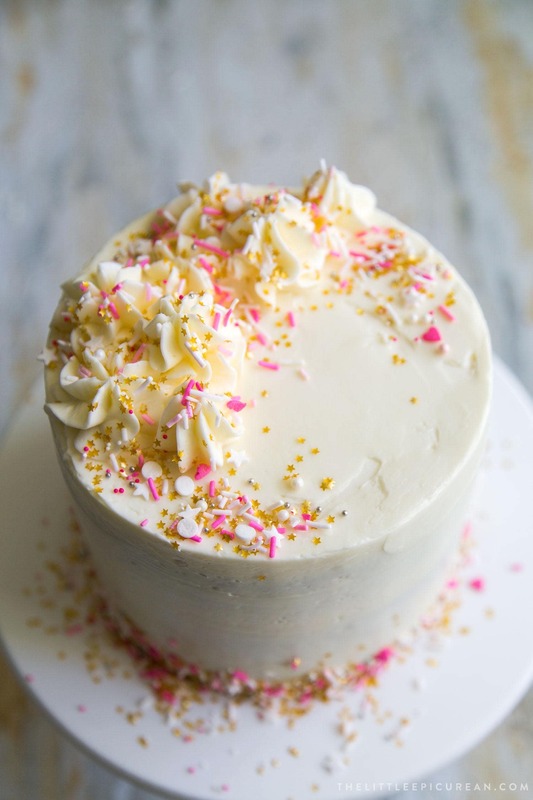 For the finishing touch, I decorated the frosted cake with a variety of fun festive sprinkles. Since Valentine’s Day is around the corner, I opted for pinks and whites. Preheat oven to 350 degrees F. Grease three 6-inch round cake pans and line with parchment paper. Set aside. In a medium bowl, whisk together sugar, grapefruit zest, and ginger. Set aside. The bowl of a stand mixer fitted with a paddle attachment (or using an electric hand mixer), beat together egg yolks and oil until slightly thickened. Add sugar mixture. Mix until well blended. Add sour cream and grapefruit juice. Mix until fully incorporated. In a large bowl, whisk together flour, baking powder, and salt. Add flour mixture in two additions to mixing bowl. Use a large spatula to gently fold flour into wet ingredients. In separate clean bowl, use an electric hand mixer to beat egg whites until foamy. Add cream of tartar and continue to beat to soft peaks. Add whipped egg whites to mixing bowl in three additions. Use the large spatula to gently fold and incorporate whites into batter. The batter will loosen as the egg whites are added. Be careful not to overmix as the egg whites will deflate. Mix just until there are no longer and streaks of white. Divide batter among prepared cake pans (about 300 grams batter per pan). Level batter as needed. Bake for 23-35 minutes until toothpick inserted in center of cake comes out clean, and cake starts to pull away from the sides of the pan. Allow cake to cool in pan for 10 minutes. 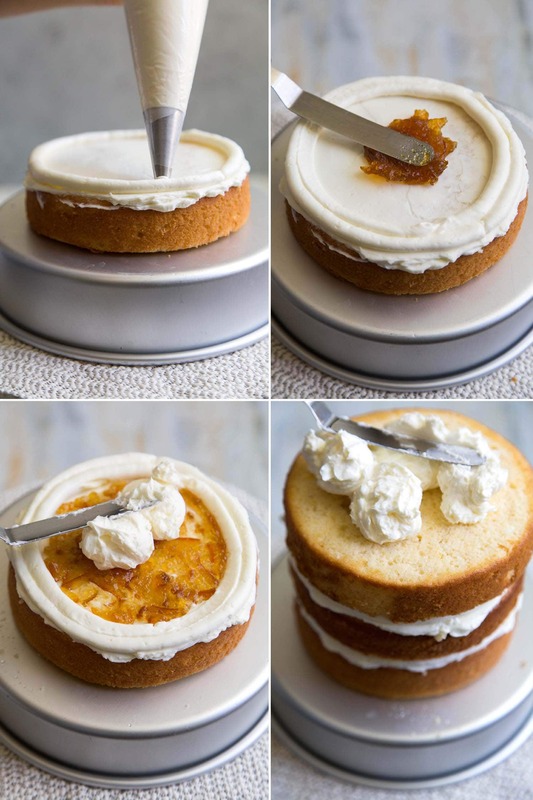 Run mini offset spatula or butterknife around perimeter of cake to ensure easily unmolding. Invert cake and transfer to wire rack to cool to room temperature. 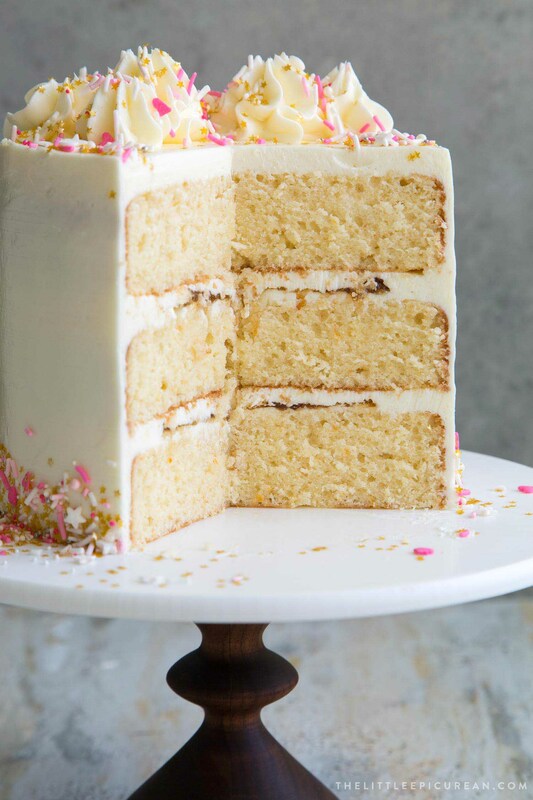 Cake layers must be completely cool before frosting. NOTE: Cake can be baked up to 2 days before frosting. Wrap cooled cake in plastic wrap at room temperature until ready to assemble. In a heavy bottomed sauce pot, combine ginger, sugar, water, and corn syrup. Bring to a boil. Reduce heat and let simmer for 15 minutes. Remove from heat and allow syrup to steep for 30 minutes. Strain out ginger. Cool to room temperature and store in the fridge until ready to use. NOTE: Ginger syrup will keep in an airtight container in the fridge for several weeks. In the bowl of a stand mixer, whisk together egg whites and sugar. Place over a double boiler (bain-maire*) and continue to whisk until mixture temperature registers 120 degrees F.
Alternatively, if you don't have a thermometer, heat the mixture until all the sugar has melted. Test this by dipped your pointer finger into warm mixture and rubbing it together with your thumb. The mixture should be smooth. You should not be able to feel the granules of sugar. Return bowl to stand mixer. With a whisk or paddle attachment, beat mixture at medium-high speed until mixture cools to slightly warmer than room temperature (about 75-80 degrees F). Reduce speed to medium and add softened butter one tablespoon at a time. Once all the butter has been added, increase speed to medium-high and beat until buttercream is light and fluffy. Add salt and vanilla. Mix until incorporated. If necessary, level cake layers. Place one cake round on a cake turntable. Brush or lightly drizzle ginger syrup over cake. 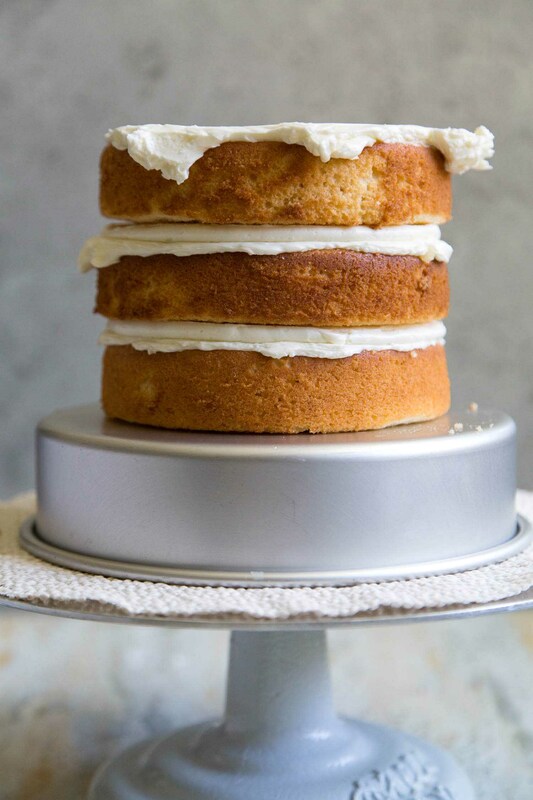 Spread a thin layer of buttercream on top using a small offset spatula. Using the filled piping bag, pipe a small border of buttercream along the perimeter of the cake round. This will serve as a barrier when orange marmalade is added. Add about 1 1/2 Tablespoon of orange marmalade to fill the buttercream boundaries. Spread another thin layer of buttercream to cover marmalade. Place second cake layer on top. Repeat soaking cake, adding buttercream, and marmalade. Place the final third layer on top. This layer does not have ginger syrup or marmalade. 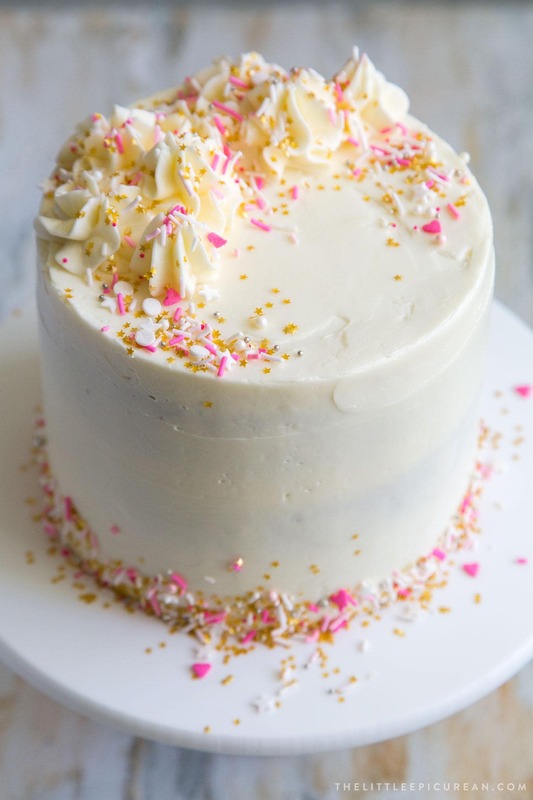 Spread buttercream around the cake to create a "crumb coat" layer to seal in any crumbs. Chill cake in the fridge for 15-20 minutes to set frosting. If desired, generously coat the chilled cake with additional buttercream. Do not use ground ginger. Freshly grated ginger will be quite moist. The flavors are fresher and cleaner than the dried ground ginger. Ginger Syrup is optional. Corn syrup in ginger syrup helps to prevent crystallization. Oh my this looks incredible and delicious. I need to try and make this though I might fail when assembling but I don’t care so long as I get the cake and eat it lol. Thanks! I hope you give it a try! When it comes to cake assembly, practice makes perfect! Ginger and Grapefruit is a combination I am unfamiliar with but am definitely intrigued to try! This looks like such a wonderful special occasion cake. I love the bright flavor of grapefruit and would love to make this cake for a special family dinner. Yum! oh my that cake looks so delicious! bookmarking this now! Thank you! I hope you give the recipe a try! first off, this looks gorgeous.. and ginger as well, i am drooling here.. 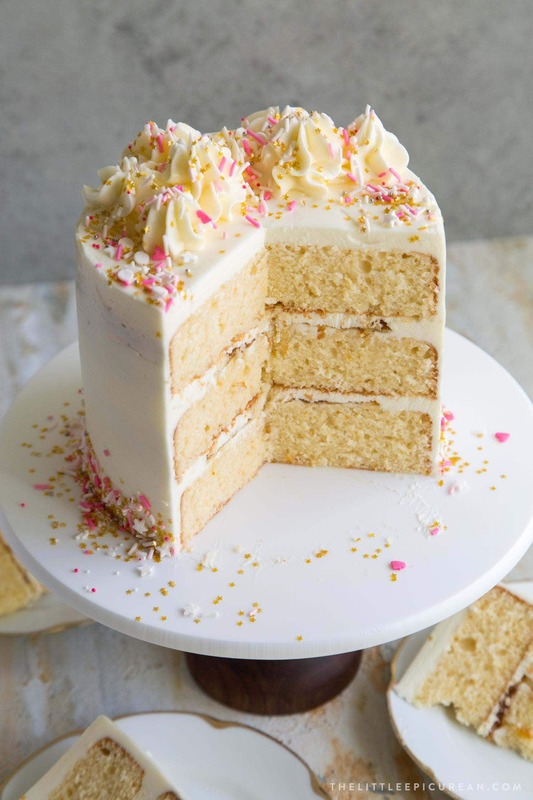 This cake is so pretty and it sounds delightful. Pinning it for later! this looks amazing! love grapefruit. I’ve never been able to make anything look as nearly as good as this. wow!